Whenever I’ve seen work by David Dean, I’ve always admired what he has done. From this book I’ve learned a lot about the tradition he admires and is a part of. David Dean is Choctaw by birth and educated in Kiowa ways. This new book is a wonderful epitome of bringing together many links to different Native American bead working techniques. The usual format is followed, with history, materials needed for beadwork, but one really interesting chapter dealt with collecting Native American Beadwork. This isn’t a chapter that most books have and this subject Chapter contains such practical advice. I love loom work and the chapter devoted to loom work was my favorite. Several historic looms are covered, such as Tension loom, Bow loom and Box loom. Then he gets to the heart of matter–for me at least–with the heddle used in conjunction with the loom. There are even directions for making the heddle. 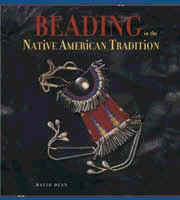 Bead Embroidery has a chapter, although it is called Appliqué Beadwork. Beautiful designs and examples are shown. I love the examples and drawings of the Crow Running Stitch, the Return Stitch and the design possibilities suggested by this chapter. Further along the Gourd Stitch and Comanche Brick Stitch are given a chapter. These stitches are known in the Anglo/European world as brick stitch and peyote stitch. The Native American adapted these stitches to fit onto rounded, solid objects. The last chapter that covers stitches is grouped as Uncommon Beadwork Techniques. There is an embossed stitch and Winnebego Side-Stitch, which looks really interesting to try. The very last chapter of the books ties up those finishing questions, has Native American designs, patterns, graphs, outlines and even the side-stitch graphs and suggestions. The single thing I liked about best about this book is not a single thing. It is twofold. I really enjoyed the photos of new and old beadwork. They are just smashing. Then I was so pleased to find philosophical quotes and practical hints inset and delineated by color and design scattered through the chapters. I found these charming, informative, and wonderfully serendipitous. This is wonderful book. It is hard to send the copy from Interweave Press onto the library, but I’m sure I’ll buy my own copy soon.